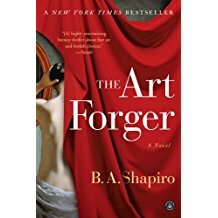 I recently read The Art Forger: A Novel by B.A. Shapiro. It’s an interesting read and I’d give it 4 out of 5 stars. You can find it on Amazon and is free to borrow as a Prime member, which is how I got it. The story involves a very technical (for my tastes) description of how to forge art. While potentially interesting, there’s much too much detail and repetition of these details throughout the book. I think the author’s goal was to show how hard it is to forge art and that forgers are great artists in their own right. It seems appropriate that, in a week were a painting fetched a record-breaking price on the market (a da Vinci that went for $450 million), I was reading this book where the author seems to question what gives painting its value. What makes the da Vinci worth $450 million? Is it an investment? Is it because the painting is so beautiful? Is it because people recognize da Vinci as a premier artist? Is it because people like to own things that other people want, thus denying them the right to have it? Or is it because the buyer wants to flaunt their ability to buys something? Through her heroine(? ), Claire Roth, a talented artist who supports herself by forging paintings, her specialty is Degas–one of my favs), until she’s discovered, Shapiro asks these questions in a very subtle way. The novel, marketed as a mystery, is really light on the mystery. A Degas painting was stolen from a private museum by unknown thieves along with a number of other priceless paintings and has been missing for decades. A friend brings Claire the Degas and offers her a deal to make a copy — to forge the painting so he can return the original to the museum and sell the copy. This seems an odd request, even to Claire, but she agrees because she needs the money and the friend offers her a one-woman show at his prestigious gallery. Shapiro spends much of the book explaining to us how Claire creates such a forgery, which I found tedious. She also includes letters between the collector who assembled the art, who transferred ownership to the museum upon her death, and a niece that details her relationship with Degas. It isn’t clear in the book, and it wasn’t until I finished the book that I discovered someone destroyed the letters, likely the niece. I spent the whole book waiting for them to surface to help Claire resolve the mystery of the Degas painting, but they never did. I would still recommend the book, just skip over the description of forging and don’t expect much of a mystery. The characters are pretty flat and the mystery is really thin. Claire isn’t a particularly loveable person and an unlikely heroine, given her many non-heroic actions. Book 4, which is currently untitled is well underway. It carries on the tradition of having the FBI cyber unit work to save the country from death and destruction.